BRANDON, Man. – Dr. Dennis Anderson, the longest-serving Brandon University (BU) President since BU received its charter in 1967, will be honoured this month. The BU Board of Governors will confer the title of President Emeritus on Dr. Anderson at the University’s Spring Convocation on May 26. Dr. Anderson served as President and Vice-Chancellor of the University from 1990 to 2000. Dr. Anderson was raised on a farm near Libau, Man., and graduated from Brandon College with a Bachelor of Science in 1964 before entering Canada’s chemical industry. 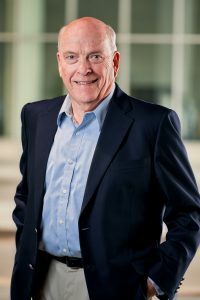 Dr. Anderson later went on to earn a Master of Business Administration from McMaster University and a PhD in Business (Marketing) from the University of Western Ontario. He credits the education he received in Brandon as a strong platform for his ensuing education and his career. During Dr. Anderson’s term as President, the “heart” of BU underwent a major renewal with an $11.3-million restoration and expansion of BU’s Original Building and Clark Hall, complete with a link to the George T. Richardson Centre and A.E. McKenzie Building complex. The University also added new degree programs in Business Administration, Psychiatric Nursing, Rural Development, First Nations and Aboriginal Counselling and the first-of-its-kind Hutterian Education Program. “I believe that each Presidential era has strengthened BU, and that tradition certainly continues under the leadership of Dr. Fearon,” Dr. Anderson said. The honorary title of President Emeritus is conferred by the Board of Governors upon a President and Vice-Chancellor who has served the University with distinction while in office. All former BU presidents and vice-chancellors who have served at least five years in the position are eligible for nomination. Dr. Anderson becomes the fifth BU President to receive the President Emeritus distinction, joining Dr. John Mallea, Dr. John E. Robbins, Dr. Earl J. Tyler and Dr. Louis P. Visentin.